At first glance, Sekiro: Shadows Die Twice seems to follow the usual Dark Souls template. Sure, it may take place in feudal Japan, but it still emphasizes combat, deadly enemies, and constant in-game deaths. But on a mechanical level, From Software has made one significant change: this game is not an RPG. According to a PC Gamer hands-on preview, Sekiro: Shadows Die Twice is an action-adventure game before all else. You do not have stats to level up with experience, nor can you collect new weapons and armor during play. You won’t even collect souls from enemies, or use bonfires as checkpoints. Instead, From Software’s Yasuhiro Kitao describes it as an action-adventure game that emphasizes exploration over stats. You can find power-ups and equipment for your mechanical hand tucked away in the environment – such as an axe that destroys shields or a torch arm that deals fire damage. But on the whole, gameplay will be a lot closer to The Legend of Zelda than anything Dark Souls and Bloodborne previously offered. Is that a problem? Well, it might nag some long-time Souls fans. That said, if you couldn’t wait to play after watching that trailer, odds are you’ll still enjoy what this outing has to offer. 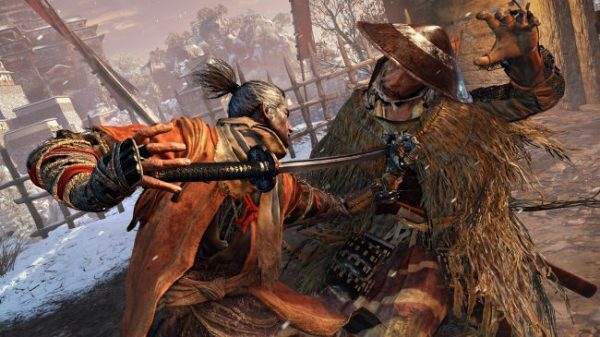 Sekiro: Shadows Die Twice launches for PC, PlayStation 4, and Xbox One in early 2019.